Forget about Freddy Mercury. Forget about Chuck Berry. In the good old days, long before the days of the idol on the stage, humanity looked to the natural world for help in satisfying their cravings for idolatry. 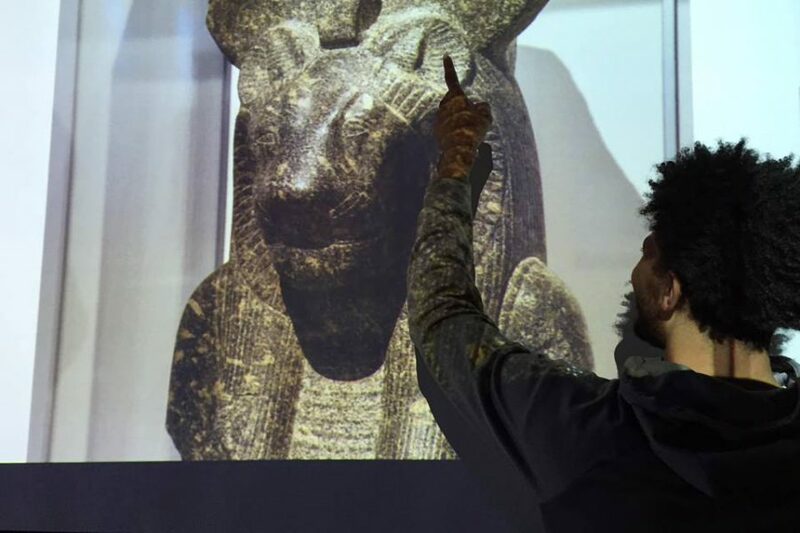 Thousands of years ago, the people of ancient Egypt—who lived in one of the world’s most advanced early societies—used a variety of materials to create artifacts representing religious figures and scenes. Those that remain today were preserved either through exceptionally fortunate environmental circumstances or through the brute strength and durability of their constitutive elements. Statue of Amun; Egypt, ca. 1332-1292 BCE (obj. E14350). Photo by Raffi Berberian. Walking through the Penn Museum’s newest special exhibition, Ancient Egypt: From Discovery to Display, we find a variety of examples of such artifacts represented in one of the strongest materials available, both then and now: stone. The objects vary considerably in their size, color, and in some cases, by thousands of years in age. 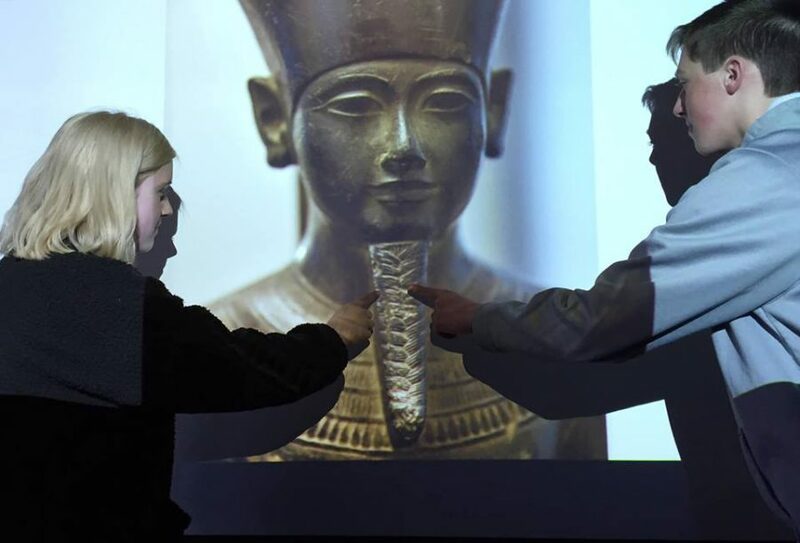 Students in Dan Leppold’s Advanced Geology class at Spring Ford High School in Royersford, PA, point to details in a photo of the stone statue of Amun. Photo by Dan Leppold. Recently, I became acquainted with Dan Leppold, a science teacher at Spring-Ford High School in Royersford, PA who teaches an advanced geology class made up of 11th- and 12th-grade students. We came up with an activity for his class based on these particular stone objects, wherein they were asked to identify the type of stone present in each object by examining the objects’ photos. Their results are in, and they’re fascinating! Let’s take a look at what they found, and talk a little about the ancient Egyptian pantheon while we’re at it. Stela with the name of King Qa’a; Abydos, Egypt, 3000–2800 BCE (obj. E6878). Photo by Raffi Berberian. 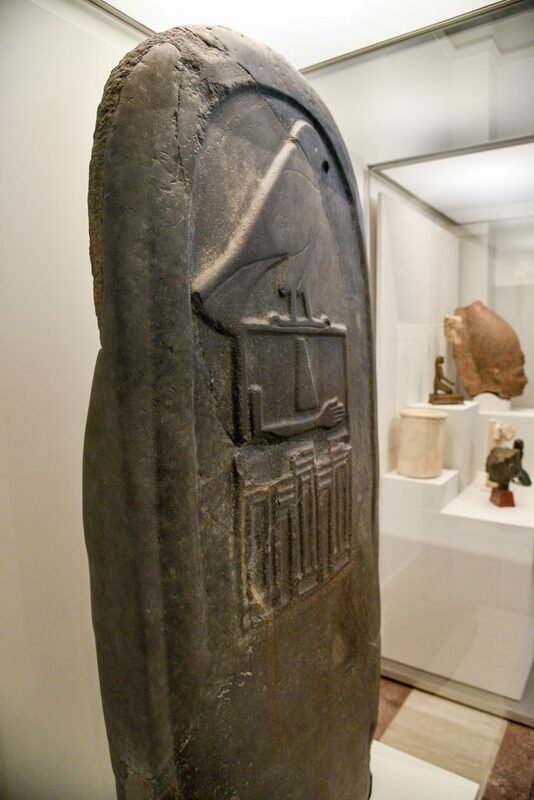 One of the oldest objects in the exhibition, the stela shown above comes from the site of Abydos—a major locus of archaeological investigation on behalf of the Penn Museum for more than a century, and of an ongoing Penn Museum research project since 1994. This stela’s excavation predates that project by nearly a century, having been unearthed in 1900 by Sir William Flinders Petrie during his work on behalf of the Egypt Exploration Fund. It was dedicated to, and bears the name of, King Qa’a, the last king of the First Dynasty of Egypt; at top, it features an image of the falcon god, Horus, an important god who took the throne of Egypt when his father, Osiris, was killed by Seth. Our object record for this artifact indicates that it is made from basalt and partially restored. We agreed with this label as being basalt, and also agreed that this hard rock would have been worthy of a statue of a king. It would have been much more difficult to carve and smooth/polish than limestone or any of the softer rocks. 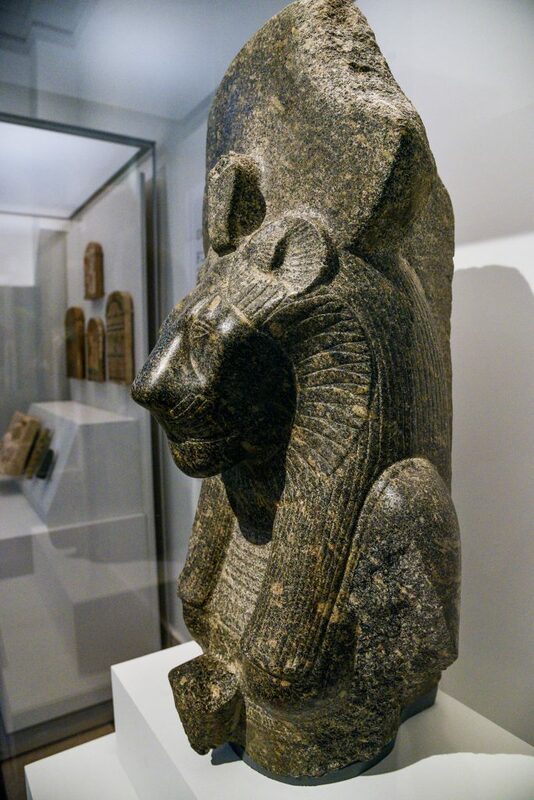 Statue of Sekhmet; Thebes, Egypt, 1539-1292 BCE (obj. E2049). Photo by Raffi Berberian. Our next rock god comes from considerably later in Egypt’s history: Dynasty 18, between 1539 and 1292 BCE, about a millennium and a half later than our previous example. 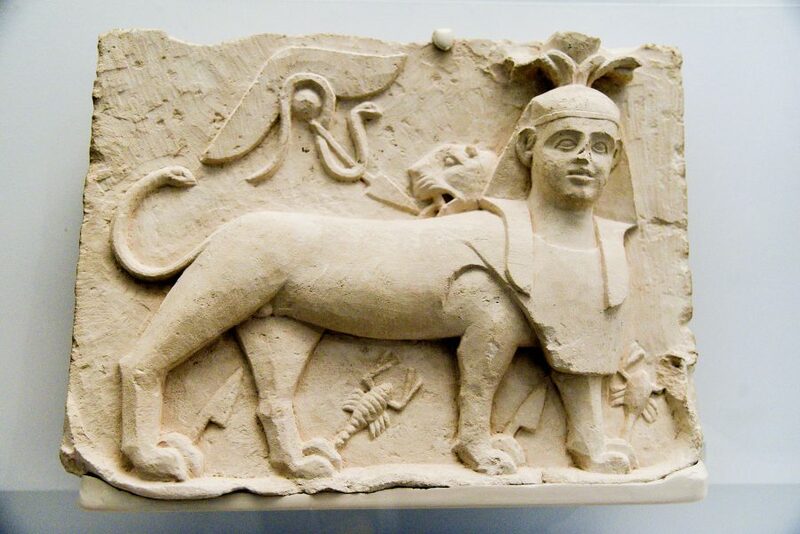 Sekhmet was the most popular of numerous deities capable of taking leonine form, and was looked on as a healer and protector against disease. Our object record identifies the stone as grandiorite. A photo from the class’s discussion of the stone artifacts. Photo by Dan Leppold. My students disagreed with calling this grandiorite. There are three main types of intrusive igneous rocks that grade from mostly light minerals (granite) to 50% light mixed with 50% dark minerals (diorite) to finally mostly dark minerals (gabbro). They felt the rock that this statue was carved from was in between diorite and gabbro (more dark minerals than light minerals). The term grandiorite “plots” in between diorite and granite, therefore this is not grandiorite because it is not light colored enough. Votive stela of Tutu; Egypt, 332-30 BCE (obj. 65-34-1). Photo by Raffi Berberian. Here, we see a depiction of the god Tutu, who entered the Egyptian pantheon during the Late Period (664–525 BCE). Tutu was an apotropaic god, capable of warding off evil; he did so through the intimidating features (scorpions, knives, and a snake tail) protruding from his body. I think it’s especially interesting to note that its nose has been damaged (more clearly visible in this photo), which is quite possibly not the result of an accident. 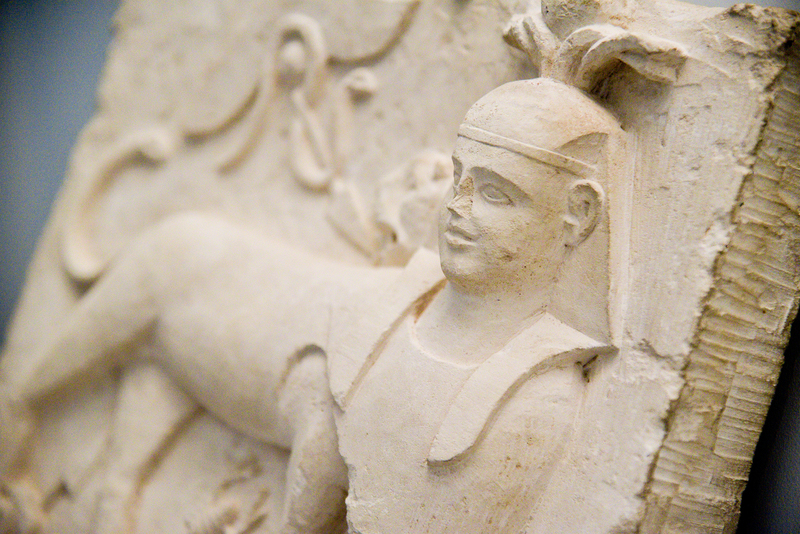 Our object record indicates that it’s made of limestone. My students agreed that this is limestone, a soft and easy to carve stone. We found it very interesting that we think we can see the grooves of the chisel that they used to carve it and that it was not worthy of applying a final polish. Seeing the grooves from the chisel made a nice human connection to the artifact and we wished we could have seen it up close (some of my students said they were going to visit the museum when they had some time in the future). 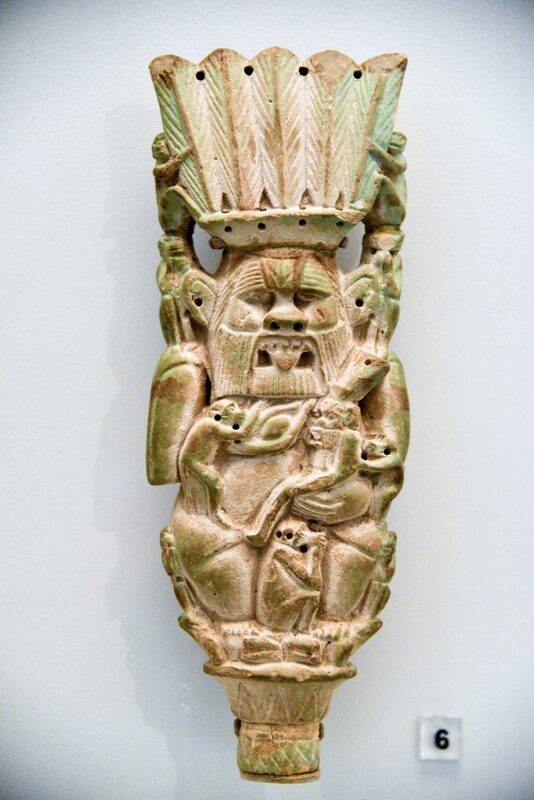 Bes rattle; Egypt, 1075–656 BCE (obj. E14358). Photo by Raffi Berberian. 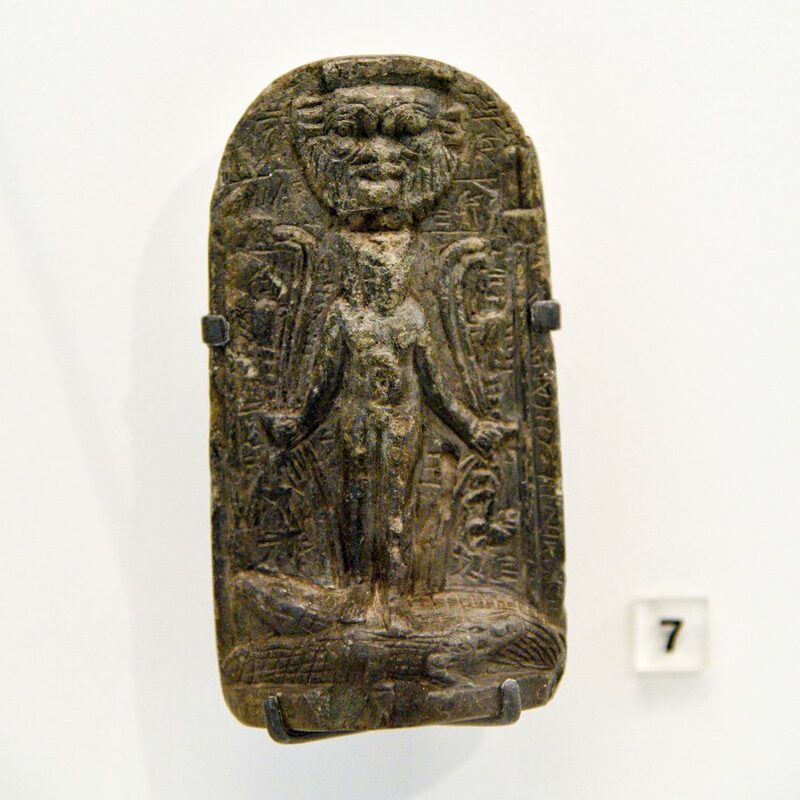 Some photos of this Bes rattle were in the mix; Bes was a dwarf-like fertility god who kept an eye on mothers and children. I told Mr. Leppold to ignore this object, as it’s made not from stone, but rather, faience—one of the earliest known types of glazed ceramic material. This one threw us for a loop so to speak. The way the artifact was carved, and the many holes drilled into it made it look soft, however if it was a soft rock like gypsum or limestone it probably would have cleaved and broken during construction of the item, let alone still exist today. My students could not agree on a rock identification for this. When I shared with them that it was labeled “faience” there was a puzzled response so we looked up that term on Wikipedia and of course there is a page dedicated to Egyptian Faience. It was really interesting to see how my students reacted when they learned that the artifact was crafted and then fired and glazed into a form of pottery/ceramic. This made sense and they immediately started congratulating each other because their final analysis of not being able identify the rock was correct because it was not a rock. I was really proud of my kids at this moment, it was a really cool experience to see them so invested in doing this activity. We felt that the explanation of how this was made should be on any label that goes along with this artifact, just labeling it “Faience” sort of cut off the story. My students started then discussing (without my encouragement) what the use of the holes were in the artifact. They felt they were significant, like flowers or oils would have been put in the holes. Horus-on-the-Crocodiles Healing Stela; Egypt, 305–30 BCE (obj. E15270). Photo by Raffi Berberian. Next, a small stela brings Horus back into the picture, this time standing atop a pair of crocodiles and using his hands to keep dangerous animals at bay—an image believed to ward off illness. The head of the protective god Bes appears above him. The material as steatite in the object record. My students immediately jumped on this not being an igneous rock and mentioned it looked to be a very soft mineral like talc. We had to google the term “steatite” and celebrated when we learned it was soapstone, basically an unpure sample of talc. If it was pure talc it would have been too soft and would have not survived all this time. Several students gave each other high fives. I was impressed they were able to tell that from just a photograph. We felt that the label should be soapstone rather than steatite, and assumed that maybe steatite is an archaic term for soapstone. 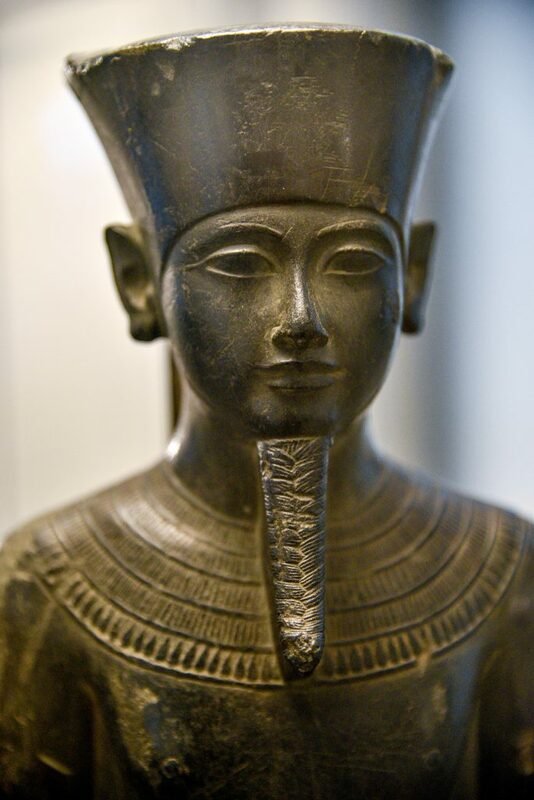 Statue of Amun (obj. E14350). Photo by Raffi Berberian. 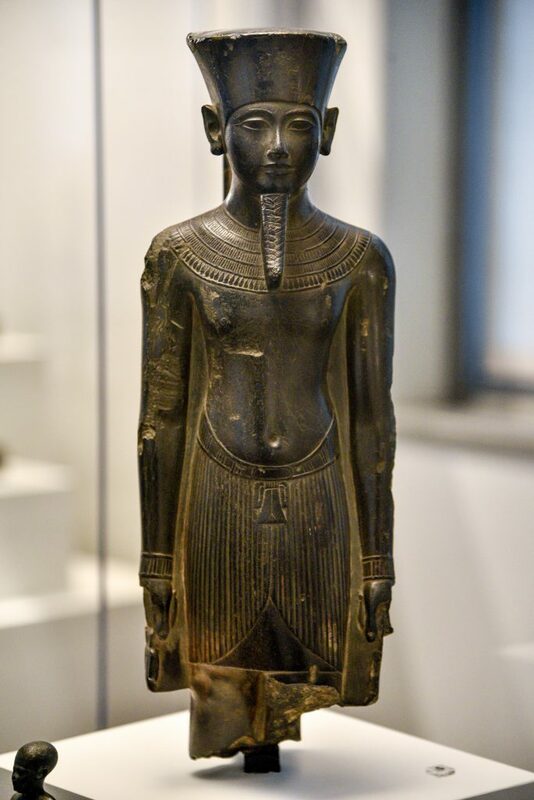 Finally, we have this magnificent statue of Amun, dating to 1332-1292 BCE. Amun became known as “king of the gods” in the New Kingdom; he was the primary creator god in one of the various well-known creation myths. Our object record identifies this material as graywacke. This statue my students identified as being gabbro like on the side and back and basalt on the front. Both are igneous rocks and felt that the subject of this statue was of importance and would have commanded a much more difficult to carve stone. When I told them it was labeled “greywacke” there was an immediate response that I can only summarize as “no way”. Graywacke is an archaic name for a type of sandstone that has some angular grains in it. We felt that a rock composed of a larger grained basalt could be mistaken for a sandstone. A greywacke sandstone would be very easy to carve… and not last the amount of time this statue has. The statue still retains a nice polish and we felt that would be unlikely if it was a sandstone. Also the importance of the subject of the artifact should have been carved in the igneous rock basalt, and that it would have been disrespectful to carve this out of a block of sandstone. My students wanted to immediately drive down to the museum and examine this closer. Again, it was rewarding for me to see the passion and confidence behind their rock identification (from pictures no less). If in the next few days you notice a young person spending way too much time looking at this and muttering bad things about “greywacke” it is probably one of my kids. These are interesting findings, some of which might have to do with older classifications of these materials in our records that are in need of modern updates. As many of these objects entered our collections as far back as a century ago or more, that’s certainly not out of the question. And these revelations speak perfectly to the spirit of the exhibition itself, which is founded upon discovery; in our conservation labs, in our collections storage, and even when objects are on public display, our understanding of these artifacts continues to grow.